Harlow Town Football Club have launched a new “Hawks Membership” for the 2018-19 season. The membership scheme is designed to reward our loyal supporters with a range of benefits. 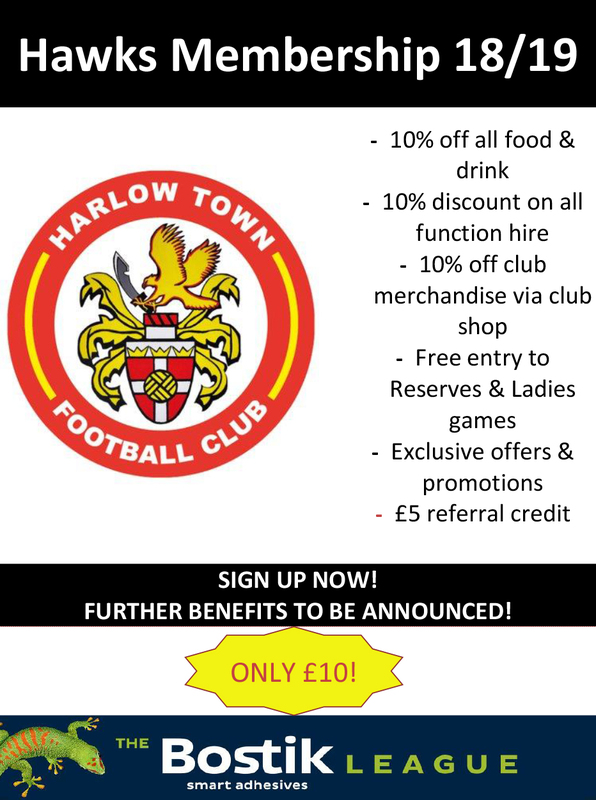 The annual membership costs just £10, and will entitle members to discounts off a range of products and services available at Harlow Town, such as match day food and drink, function room hire and club merchandise. All Season Ticket Holders are automatically enrolled in the scheme, and they can begin enjoying their benefits immediately. For non-season ticket holders, it’s simple to sign up. Download the application form below, fill it out and hand it in at the Club with your membership fee, and you’ll be able to collect your Hawks Membership card at the next home game. There will be additional savings and benefits coming throughout the season, so start saving now.